The village of Nabi Saleh is home to some 500 members of the extended Tamimi family. The villagers say that the expanding Israeli settlement of Halamish has blocked their access to a nearby source of water, a spring. For holding weekly protests against this settlement, they have suffered greatly at the hands of the Israeli Defense Forces. Israeli military law imposed in the occupied West Bank places sweeping and arbitrary restrictions on freedom of expression and assembly. This makes any unauthorized peaceful protest by Palestinians a criminal offence. Palestinians engaging in such protests face arrest and excessive force from the Israeli military on a regular basis. All of this becomes quite clear when visiting homes in Nabi Saleh. 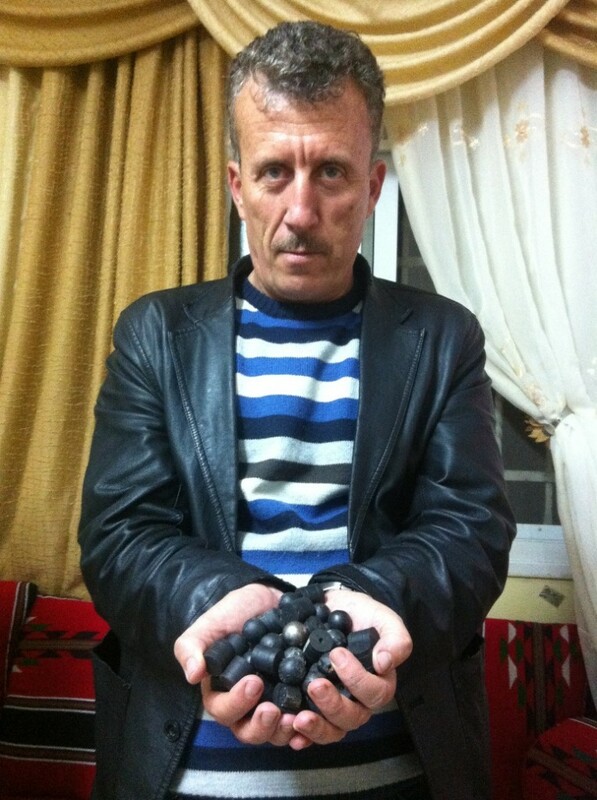 Bassem Tamimi filled his hands for me with some of the plastic and rubber-coated bullets he has collected which were fired by Israeli forces in the village. Coatings aside, each bullet I examined had a hard metal interior. Inside one of the Tamimi homes, a coffee table serves as an exhibit of used tear gas canisters and other spent munitions. And as I walked up and down the streets of this small community, residents had strung up countless more used tear gas canisters like Christmas tree ornaments. The Tamimis have experienced this tragedy because they dare to protest against Israeli settlements. Since 1967, Israel has established some 150 illegal settlements in the occupied West Bank, including East Jerusalem. The settler population has now grown to over half a million Israelis. 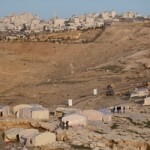 In opposing the settlements, the residents of Nabi Saleh have international law on their side. A policy of settling civilians in occupied territory – such as Israel’s settlement policy – is a serious violation of the laws of war. It can be prosecuted as a war crime under the statute of the International Criminal Court. While in Israel and the West Bank, President Obama would be wise to listen to Bassem Tamimi and other Palestinians about life in the shadow of settlements and the Israeli army. But listening is not enough. The US government must actively support Palestinians in their opposition to these illegal Israeli policies. That means that the Obama administration must insist on a complete freeze on Israeli settlement construction, instead of calling on Palestinians to resume negotiations with Israel first, as Obama did earlier today. This would be a first step to the total evacuation of all Israeli settlements from the Occupied Palestinian Territories, including East Jerusalem. Without such a clear approach, the daily human rights violations and displacement that Palestinians face because of Israeli settlements will only get worse. Israel’s new defence minister, Moshe Ya’alon, is reported to oppose any limits on settlement construction. Israel’s new housing minister, Uri Ariel, is himself a settler. Without significant international pressure, Amnesty International fears that the new Israeli government will simply continue building illegally on occupied land and using excessive – and sometimes lethal – military force against Palestinians who get in the way. President Obama must move beyond diplomatic pleasantries during his visit to Israel and the West Bank. He should bluntly address Israel’s settlement policy and the devastation to Palestinian life that lies in its wake. Bassem Tamimi, the villagers of Nabi Saleh, and Palestinians throughout the Occupied Palestinian Territories deserve no less. This entry was posted in Middle East and North Africa, Military, Police and Arms, Prisoners and People at Risk and tagged Barack Obama, Bassem Tamimi, East Jerusalem, Halamish, ICC, IDF, International Criminal Court, israel, israeli army, Israeli Defence Forces, Israeli Defense Forces, Israeli military law, Israeli settlements, Moshe Ya’alon, Mustafa Tamimi, Nabi Saleh, Occupied Palestinian Territories, Occupied Territories, OPT, palestine, Palestinian villages, prisoner of conscience, rubber-coated bullets, Rushdi Tamimi, settlements, settlers, Tamimi, tear gas, Uri Ariel, war crimes, West Bank by Sunjeev Bery. Bookmark the permalink. Sunjeev Bery serves as Advocacy Director for Middle East North Africa issues at Amnesty International USA. Yes – they have their reasons for protesting. First, they have a right to expression – especially on their own land and when that land is slowly, but surely being confiscated, usurped and used to build illegal settlements that take not only their land – but their water and freedom of movement and even their hope for any kind of sustainable, long-term peace. No – as someone has attended these protests as an observer – they do not send their children out in 'hope they will get arrested' and provoke an international response. The children go out because you can't stop them. They are children and will attend. I do know that in Bi'lin, the adults hold a session for 'internationals' that come to participate to share with them their story, to explain that they would rather be working and taking care of their children, but feel they have no choice because with the wall/fence and encroaching settlements their childrens' futures are being diminished and to encourage peaceful protesting – no provocative actions, stone throwing, etc…. But you're right – violence does happen at some of these protests. At various points and in various locations (depending on what's happening) Israeli soldiers use tear gas, live ammunition against unarmed protesters and beatings and many times Palestinian villagers will throw stones – usually the youth. Molotov cocktains? I know youth have thrown these in more urban protests, but as a norm, this is not something that happens in the protests in the villages protesting the wall being built on their land. And, even when and if stone throwing and other acts of violence takes place – you miss the bigger picture. These people are on their own land protesting. Why are the soldiers there in the first place? Or, since they are there, the excessive use of force against mostly peaceful protesters. I think your comment simplifies the situation and represents a minority of cases. There are certainly acts of violence that occur, but they are certainly NOT 'more worrisome' than the ongoing human rights violations that are taking place in the Occupied Palestinian Territories. And sorry – should have included link to article issued by Amnesty International, April 4, 2013, a couple of weeks after this post: 'Israel/OPT: Stop Use of Excessive Against Palestinian Civilians in the West Bank' at http://www.amnesty.org/en/news/israelopt-stop-use…. Thank you. I'm sure there are many such places. More people than we can imagine are living under these conditions, fearing their lives every day and not being able to speak their minds.